« Global debt crisis ahead? There is a book sweeping the popular media at the moment. It’s called Factfulness. It purports to argue that, contrary to the conventional wisdom, the world is becoming a better place. Poverty is falling, life expectancy is rising; health levels are improving; people have more things and better services. Even violence and wars are in decline. This is a hoary old message that has been expounded in the past by billionaire Bill Gates, among others. Indeed, he gives this new book much praise – as it justifies his view that things are getting better for the majority and with the right policies on health, education, population, climate change etc, the world can progress without any change in its mode of production and social structure. I have taken up this optimistic message in previous posts and my latest book, Marx 200, discusses the dialectical nature of the development of capitalism – something Marx recognised as early as 1848 in the Communist Manifesto. Yes, capitalism has taken the productive forces forward like no other mode of production before (slave society, feudalism and Asian despotism) but it also carries with it a dark side of increased exploitation, dominance of the market and machine over people’s freedom and livelihoods; and global wars and even the destruction of the planet. In contrast to the optimistic Factfulness, the latest World Inequality Report is a sobering analysis. Inequality between rich and poor is widening at an increasing pace. The authors, the most highly respected experts on inequality of income and wealth globally, conclude that the number of billionaires rose by the biggest amount ever in 2017, while over half the world’s population lives on between $2 and $10 a day. The report shows the share of wealth held by the top 1% of earners in the US doubled from 10% to 20% between 1980 and 2016, while the bottom 50% fell from 20% to 13% in the same period. Kofi Annan, former head of the United Nations, called this scale of global economic inequality “staggering and shaming”. 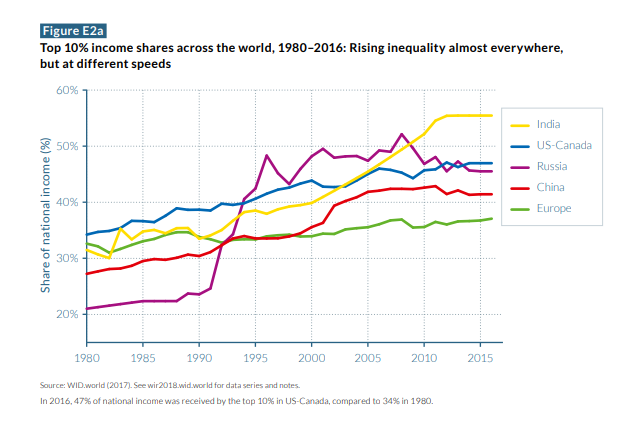 The authors find that income inequality has increased in nearly all world regions in recent decades, but at different speeds. Since 1980, income inequality has increased rapidly in North America, China, India, and Russia. Inequality has grown moderately in Europe. 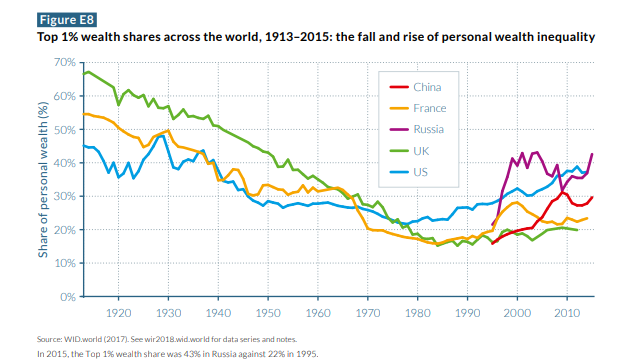 At the global level, inequality has risen sharply since 1980, despite strong growth in China. The poorest half of the global population has seen its income grow significantly thanks to high growth in Asia (particularly in China and India). 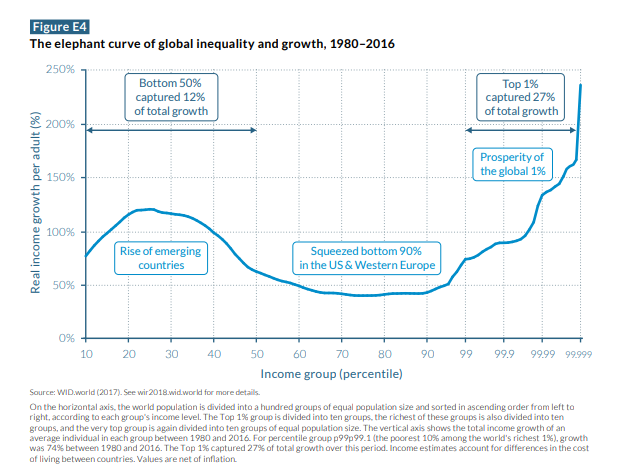 However, because of high and rising inequality within countries, the top 1% richest individuals in the world captured twice as much growth as the bottom 50% individuals since 1980. 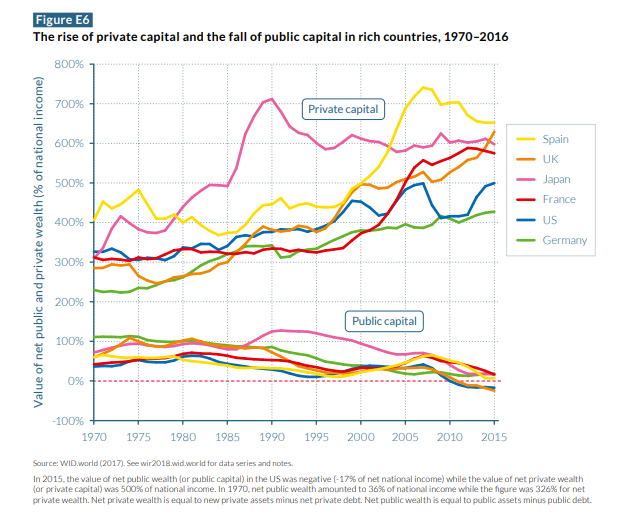 The authors reckon that the combination of large privatizations and increasing income inequality within countries has fuelled the rise of wealth inequality, even if it has not yet returned to its extremely high early-twentieth-century level in rich countries. The rise in wealth inequality has nonetheless been very large in the United States, where the top 1% wealth share rose from 22% in 1980 to 39% in 2014. Most of that increase in inequality was due to the rise of the top 0.1% wealth owners. In my view, inequality of wealth and income is an inherent feature of class societies, and capitalism is no exception. But that does not mean it would rise indefinitely, a point made by the Inequality report. That depends on dynamics of capital accumulation and policy action by governments. Naturally, the authors (or Kofi Annan) do not propose a radical restructuring of the capitalist system ie its replacement. Instead, they look for progressive taxation of incomes; control of tax evasion and offshore havens for wealth; ‘more education’ and public investment. The problem with these worthy policies is that they cannot be implemented if the interests of capital are to be protected, particularly when capitalism is struggling to sustain the profitability of capital precisely by holding down trade union strength (which is an important counter to rising inequality ignored by the authors); maintaining privatisations (not public investment) and ‘deregulating’ labour markets ie by increasing the overall exploitation of labour. Moreover, recurring crises in capitalist production are not the result of rising inequality (although some leftists argue this); and so the real faultlines of capitalism will not be resolved by reducing inequality. What is also missing from the report is why wealth inequality has risen – it is mainly the result of the increased concentration and centralisation of productive assets in the capitalist sector. The real wealth concentration is expressed in the fact that big capital (finance and business) controls the investment, employment and financial decisions of the world. A dominant core of 147 firms through interlocking stakes in others together control 40% of the wealth in the global network according to the Swiss Institute of Technology. A total of 737 companies control 80% of it all. This is the inequality that matters for the functioning of capitalism – the concentrated power of capital. This entry was posted on May 15, 2018 at 12:23 pm and is filed under capitalism, economics, Profitability. You can follow any responses to this entry through the RSS 2.0 feed. You can leave a response, or trackback from your own site. Indeed. Here is another name, Michael. Stphen Pinker is a big name, but a mediocre writer as John Gray has described him. Pinker is a leading liberal and apologist for US imperialist violence, and who belives that wars and violence have declined and things in general are getting better. I haven’t seen the book and do agree with both the final paragraph of Michael’s post and the basic point that supporters of capitalism endlessly blather that “You’ve never had it so good” in denial of both the fact that the things could be awful lot better once we get them out of the way and that their system is directly responsible for a lot of darkness. Being vastly superior to medievalism and fascism, including their “modern” variants is a pretty low bar that complacent conservatives set themselves. But I do think revolutionaries, and especially Marxists need to emphasize how far we have come and not just the dark side. Marx did that too and it has become far more necessary now than it was in Marx’s time when the Communist Manifesto strikingly proclaimed its support for globalism. It is far more important now because the left has been completely swamped by outright reactionaries moaning about how things are going from bad to worse. In the nineteenth century everybody understood that this world outlook was central to the right and opposed by the left. These days the popular myth is that the left are the people who whine most about how things are going from bad to the worse. It is necessary or at least unavoidable for anyone opposed to the status quo to highlight how bad it is. But our point should always be that that we can and HAVE through struggle made things so much better. The main message of any ruling class has to be that its opponents are isolated in time and space and that history is on the side of the status quo. They say that rebellion has always been a failure and that nobody else is rebelling now. Things have always been pretty much as they are now and they are gradually getting better under their enlightened rule. It sounds “militant” to insist that everything is getting worse and worse. The more loudly one says that the more one can pose as a revolutionary. The result has been for the actual left to have been almost completely displaced by loud mouthed “militant” reactionaries whose concrete policy proposals are very hard to separate from those of the far right. Policy convergence on such issues as protectionism and “anti-globalization” is not accidental but related to a shared backward looking rather than forward looking world outlook. Right… as opposed to loud-mouthed pseudo-Marxist advocates and supporters of assaults and invasions conducted by the United States and UK military forces. Such policy convergence on issues like military invasions is not accidental but related to the shared nonsense that capital has a “progressive” side, can play a progressive role. I won’t follow you further off topic, but certainly agree that the opposition to the war against fascist regimes from the 1930s to now were indeed fought and opposed by alliances of communists and less reactionary capitalists on the one hand and people making loud mouthed proclamations of their anti-capitalism on the other, for example the German National Socialist Workers Party. A more relevant and striking modern example would be the bizarre solidarity with the Syrian fascist regime that has displaced half the population of Syria and driven millions into exile while the rest of the world sits back and “anti-imperialists” congratulate themselves on having more than the far right in agreement with non-intervention for a change. Refusing to invade and occupy Syria is actually so mainstream these days that it must be hard to keep pretending it is “left”. Arthur, why would you quote Mao as a source of authority to back you up on anything? Isn’t Mao exactly the kind of militant authoritarian reactionary you are talking about? The kind “whose concrete policy proposals are very hard to separate from those of the far right.”? Richard, the only “authority” I referenced to backup my progressive world outlook hostile to reactionaries was the same authority that Mao referenced – the authority of the historical facts. “They are wrong because they agree neither with the historical facts of social development over the past million years, nor with the historical facts of nature so far known to us …”. The loud mouthed “militant” reactionaries I referred to include both more authoritarian and less authoritarian types. Perhaps the more authoritarian ones tend to be more obnoxiously loud mouthed but it wasn’t any part of the point I was making. The far right also includes both types. The policy convergence is what is really striking when you get such phenomena as “anti-globalization” and “populism” having been central to what passed as “left” for decades and now generally understood more correctly as banners associated with the right and especially the far right. It would be too far off topic to enter into debate about Mao’s historical role. “Inequality has risen sharply since 1980, despite strong growth in China.” Not ‘despite,’ rather ‘along with’.The Chinese Gini coefficient of income inequality is near that of the United States. Such is capitalist industrialization, an old story: Inequality rose sharply in the U.S. from 1860 to 1900, despite strong growth. Agreed, and an important point worth stressing. Conservatives in both China and the West, including both social fascist and social democratic advocates of a bigger capitalist state, stress this point as part of their position that There Is No Alternative to capitalist industrialization. They argue that there is a trade off to be made between more equality and more rapid development of industrialization. Communists argue that there is no such trade off. Both because growing capitalist inequality and pauperization of the masses is a necessary pre-requisite for “expropriating the expropriators” and because capitalist social relations, including this inequality, have ceased to be historically progressive overcoming fetters on the productive forces from feudal social relations and become fetters holding back more rapid development of the productive forces. It would be better to refer to “capitalist rule” rather than “capitalist industrialization” as so many people are taken in by reactionary opponents of modernity and especially industrialization posing as “left”. This is not just open “greens” but also people claiming to be “red” and is now so widespread as to be taken for granted both by more “mainstream” conservative opponents of what they insist on calling “the left” and by a vast swamp of reactionaries who equally insist on calling themselves “progressive”. “capitalist social relations … have ceased to be historically progressive .. and become fetters…”. The TRPF cannot be the explanation for this development, since the TRPF has been in force since at least the early 19th century. Something new emerged; see The Hollow Colossus for a genuinely historical analysis. “capitalist social relations … have ceased to be historically progressive .. and become fetters…”. The TRPF cannot be the explanation for this development, since the TRPF has been in force since at least the early 19th century. Something new emerged. Charles, you accurately quoted me and initially posted your comment as a response to mine. But there is no connection between the long term Tendency of the Rate of Profit to Fall and anything I said. I happen to agree that this long term tendency cannot be an explanation of recurring crises. Michael’s opposite view seems to me to be widespread among Marxians largely because competing theories like “underconsumption”, “inequality”, “rapacious banks” and “profit squeeze” are even more obviously absurd. But crises are most certainly related to “capitalist socialist relations … become a fetter on the productive forces”. Crises became regular after the struggle against feudal social relations had largely been won and specifically relate to the fettering of those more advanced productive forces that became possible with large scale machine industry. Indeed, as Marx outlined and Maksakovsky explained systmatically, crises are the mechanism which drives the TRPF rather than the other way round. Crises are needed to break the fetters imposed by capitalist relations of distribution that prevent the deployment of more productive technologies with a higher organic composition of capital that only become economically viable after more labor intensive technologies that were previously dominant have been forcibly made technolgically obsolete by the collapse in prices and sharply reduced profit rates following a crash. This lowers the average rate of profit for the next cycle despite higher real wages even after prices and profits have “recovered” from the crash. “Something new emerged”. Yes, but the regular business cycle is not new. What is new that needs explanation is not the crises that used to regularly mark the end of one cycle and beginning of another, but the lack of such crises during the “Great Moderation” following the end of World War II. For that we need to first grasp the explanation given for the previous situation by Marx and Maksakovsky and then develop it further taking into account changes since their time. PS. If you have some alternative “genuinely historical analysis” you would need to make it freely available if you hope that many others will read it. There is too much available free for anyone but well established authors to reasonably hope for an audience that will go to any more trouble than a click to download, regardless of how cheap a hardcopy may be or how many times its author, as opposed to a commercial publisher, says it is worthwhile. Please mention here which workaround works for you so that others in same country can use it. “Factfulness” starts with a quiz. Most people score worse than random. I started the book, did the quiz and now intend to finish the book before other reading. This blog post has the full quiz. Warning: Note down your answers first, stop reading that page at the last question until you do. The answers on the same page are spoilers. Michael, did you actually read the book? I think your article is only about the media coverage, not about the book. Its not incompatible to say that inequality is rising, and yet things are getting better for the majority. It is the basic premise of Marx’s analysis. As Marx points out in the Critique of the Gotha Programme the fact that the wage slaves become affluent does not change their fundamental condition of being slaves who can only enjoy that affluence by providing increasing amounts of unpaid labour. The idea that there was some requirement to keep workers in a condition of poverty was the concept of Lasalleans not Marx. I have finished the book now and again strongly recommend it (especially to Michael who seems to have NOT yet read it). Do above first for quick preview without spoilers. Numerous surveys done with this quiz. Consistently show that most people including most “experts” consistently do worse on choosing between 3 plausible answers to basic factual questions about the world than random one out of three guesses of “Chimpanzees”. Brief poster style summaries with links to download copies and detailed statistical background. Whether you like it or not this stuff is getting a wide mass audience, complete with teaching materials to introduce it into primary and secondary education. If you think they are wrong you need to know what they are saying to refute them. I have only noticed one clear factual error. Book correctly says no “population control” measures are needed other than development as people have less children as they become less desperately poor. Wrongly claims Mao introduced China’s “one child” policy (which is now ending). Fact is it was introduced by opponents of Mao in current regime.